Introduction: Osteitis is one of the most serious complications in orthopedic surgery. Expert Tibia Nail (ETN) PROtect™ coated with a biodegradable layer of gentamicin-laden polymer was developed for prophylaxis of osteomyelitis. In systemic administration, gentamicin has only a small therapeutic index and serious side effects; it is potentially nephrotoxic as well as ototoxic. It is not yet known if relevant gentamicin concentrations are released into the systemic circulation after implantation of gentamicin-coated nails. In order to evaluate the patients’ risks profiles and increase patient safety, we measured gentamicin levels in pre- and postoperative serum samples of patients undergoing implantation of ETN PROtect. Methods: Twenty-five patients who received ETN PROtect between March 2012 and August 2014 were included in this study. Collection of blood samples occurred before the operation, at weeks 1–4, 3 and 6 months, and up to 1 year after the implantation. Measurement of gentamicin levels in serum samples was performed at the central laboratory of Heidelberg University Hospital. Additionally, laboratory parameters, C-reactive protein, leukocyte number, urea and creatinine concentrations were analyzed in routine controls before and after operating and assessed for systemic side effects. Results: Over the course of this prospective observational study, we were able to determine that gentamicin-coated nails do not release gentamicin into the systemic circulation above the lowest detectable level of 0.2 mg/dL. There were slight increases in the mean inflammation and renal retention markers, but no gentamicin-associated side effects could be linked to implantation. Furthermore, no allergic reactions could be detected during our study. Conclusion: Our findings suggest that there is no relevant release of gentamicin into the systemic circulation causing a systemic effect, and serious side effects due to gentamicin-coated tibia nails should not be feared. Postoperative monitoring of renal function does not seem necessary because of the implantation of ETN PROtect. Gentamicin is an antibiotic of the aminoglycoside group.23,24 Its spectrum of action covers most Gram-negative bacteria as well as Staphylococcus aureus.24 Therefore, its active spectrum includes the most common bacterial strains involved in infections after orthopedic surgeries or following open fractures,25–27 namely staphylococcus species, which was found in 50%–80% of infections in an orthopedic setting.19,27 However, gentamicin is potentially nephrotoxic and ototoxic, and renal function should be monitored during the time of systemic administration.28,29 Contraindications for the systemic administration of gentamicin are current pregnancy, inner ear damage, renal insufficiency, myasthenia gravis, and co-medication with other nephrotoxic or ototoxic drugs. Furthermore, a known allergy against gentamicin is a contraindication for use. Although gentamicin would be suitable for treating osteitis,18 it is not a standard drug for systemic antibiotic prophylaxis in orthopedic surgery because of serious dose-dependent side effects and a small therapeutic index.14,23 A systemic administration of gentamicin is limited to cases of serious infections, when other antibiotics do not work. To hinder complications, therapeutical drug monitoring of gentamicin levels in serum is established. In this study, we investigated how safe ETN PROtect is in a clinical setting, especially its systemic impact, nephrotoxic side effects, and allergenicity. Therefore, gentamicin levels were determined in serum samples taken before and after implantation of ETN PROtect. This study was conducted in accordance with the Declaration of Helsinki.31 All individuals followed the study protocol. The study was approved by the ethics committee of the Ruprecht-Karls-University of Heidelberg (S-636/2011). Patients (n=24) underwent implantation of ETN PROtect/gentamicin-coated tibia nails between March 2012 and August 2014 at our clinic, and were included in the study. Patients were over the age of 18 and gave formal written consent for surgical treatment. Due to fracture of the nail, one patient had to undergo two operations within an interval of 8 months, and both times a coated nail was used. From this patient at both operations tissue and blood samples were collected; therefore in total 25 cases (n=25) from 24 different patients were taken into account. Peripheral blood samples were drawn over a period of 1 year following a standardized time pattern, as seen in Figure 1. Figure 1 Time points of blood sampling. Mean values of laboratory parameters for all patients at different time points were descriptively analyzed. Standard deviations (SDs) for the assessed parameters and range were described. Patients demographic details are shown in Table 1. The dates of the blood collections for each patient are given in Table 2. Body mass index in the patients’ cohort ranged from 18.75 to 52.16 kg/m2. The mean body mass index was 30.81 kg/m2 with an SD of 7.23 kg/m2. We were not able to detect gentamicin levels higher than the lowest detectable level of 0.2 mg/L in any of the 139 serum samples. The preoperative mean values of the collected laboratory parameters were 31.80 mg/dL with an SD of 5.82 mg/dL for urea, 0.95±0.14 mg/dL for creatinine, 7.53±2.22 nL−1 for leukocyte count, and 8.29±9.21 mg/L for CRP. Except for CRP, which has an upper reference range limit of 5 mg/L, all initial values were within the reference range. 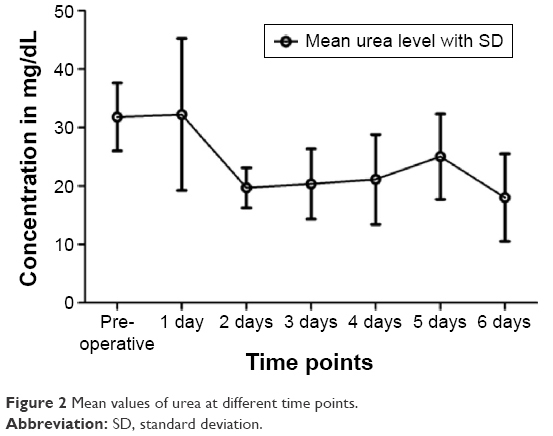 On average, the concentration of urea in patients’ serum decreased from 32.22±13.00 mg/dL on the first day after operation to 19.67±3.43 mg/dL on the second day. It leveled between 25.00±7.29 mg/dL and 18.00±7.48 mg/dL on the following days (Figure 2). Figure 2 Mean values of urea at different time points. 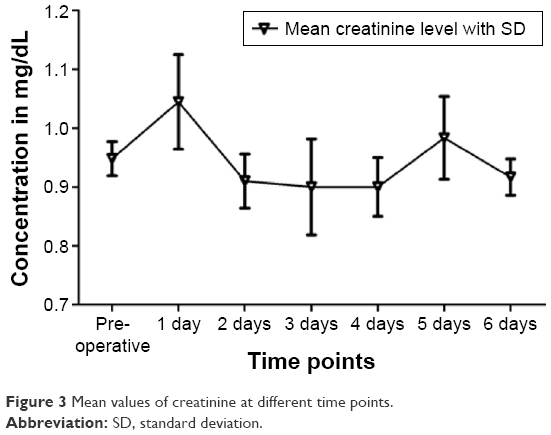 The average creatinine levels increased from the time before the operation (0.95±0.15 mg/dL) to the first day after the operation (1.04±0.24 mg/dL), but dropped below the initial value on the following days, except on the fifth postoperative day (0.98±0.17 mg/dL) (Figure 3). Figure 3 Mean values of creatinine at different time points. In one patient, renal retention markers showed a noticeable increase: creatinine level rose from 1.1 mg/dL preoperatively to 1.4 mg/dL (reference range <1.3 mg/dL) postoperatively, the urea level likewise from 37 to 55 mg/dL (reference range <45 mg/dL). This was the only sample in which urea and creatinine levels above the upper reference range limit were detected. 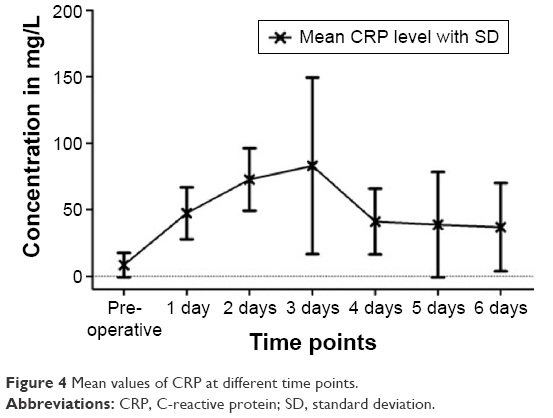 CRP as a marker of inflammation showed on average an increase from 8.29±9.21 mg/L (reference range <5 mg/L) preoperatively to 47.29±19.51 mg/L on the first day, 72.66±23.48 mg/L on the second, and 82.96±66.41 mg/L on the third day postoperatively. A significant decrease was already apparent on the fourth day at 41.01±24.75 mg/L. Subsequently, average CRP values approached the initial value. Several patients showed a CRP above 100 mg/L, mostly on the second or third day after the operation, but all showed declining infection parameters and a decrease within 1 or 2 days thereafter. The highest registered CRP value was 183.3 mg/L (Figure 4). Figure 4 Mean values of CRP at different time points. Abbreviations: CRP, C-reactive protein; SD, standard deviation. The mean leukocyte count preoperatively was 7.53±2.22 nL−1; on the first postoperative day, it was 9.30±2.27 nL−1. It declined in the following days, but stayed within the reference range. Leukocyte count differed from the reference range of 4–10 nL−1 in some patients. One patient showed intermittent leukopenia preoperatively as well as postoperatively. Six other patients showed slight leukocytosis as high as 12.74 nL−1 (Figure 5). These values normalized within 1–2 days. 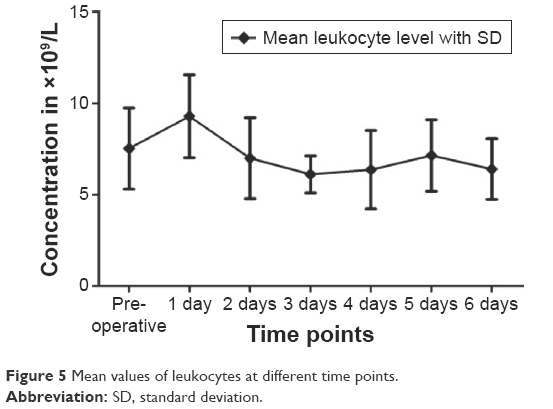 Figure 5 Mean values of leukocytes at different time points. All patients could be released within 15 days after surgery, with declining infection parameters. No allergic reactions or serious side effects were observed. In this prospective observational study with 25 patients treated with ETN PROtect, we confirmed that gentamicin-coated nails do not release gentamicin above the lowest detectable level of 0.2 mg/dL into the systemic circulation. The major strengths of this study are its prospective approach and the inclusion of serum samples from the first day after implantation. Osteitis and osteomyelitis are feared complications of orthopedic surgery. Metallic implants are especially prone to infections.8,11 Routine prophylaxis involves the perioperative administration of antibiotics, but this has the downside of systemic side effects and the danger of insufficient doses of antibiotics at the operation site.4,38 An alternative is the local application of antibiotics through drug-coated implants like ETN PROtect. The gentamicin sulfate (up to 20–50 mg) incorporated in the amorphous PDLLA matrix is released in an initial burst followed by a continuous phase, as in vivo and in vitro experiments have shown.37 We were able to demonstrate successful treatment with ETN PROtect in patients with increased risk for infections in the clinical setting.3 Local application of gentamicin has been proven successful and effective in the prophylaxis of infection.1,18,37,39 Local concentrations high enough for prophylaxis do not affect bone healing in a negative way.30 But, in order to increase patient safety and adequately educate patients preoperatively on the risks and effects of the treatment with ETN PROtect, we need to know if a systemic effect is possible. Consequences could be an indication for therapeutic drug monitoring and monitoring of renal function after implantation. A serious rise of CRP above 200 mg/L within a few hours would have been suspicious for severe inflammation or bacterial infection.40 Since all increased CRP values remained below 200 mg/L and declined within a short period of time, there were no signs of postoperative infections.41,42 Leukocytosis is not only a sign of chronic inflammation, but also a sign of metabolic crisis, acute blood loss, acute hemolysis as well as pain or the body’s reaction to stress.43 We have observed the change in inflammation markers due to trauma during surgery.42,44 We could observe a slight average increase of urea and creatinine that remained within the standard range. Generally, urea may rise due to fever, trauma, hypovolemia, or a catabolic state of metabolism.42,45 Creatinine is primarily a sign of acute renal dysfunction, possibly severe blood loss, damages due to drugs, hemolysis, and chronic renal damage.42 Both parameters can rise to values above the upper reference range limit shortly after a surgery, due to trauma and blood loss. Altogether, the analysis of laboratory parameters showed changes matching a physiological response to surgical trauma. One patient showed a conspicuous change in creatinine and urea. Infection parameters were also increased, but clinical course of the patient was inconspicuous. Ten days after the operation, renal retention markers were controlled and had returned to the initial value. The patient was released 14 days after surgery, with declining infection parameters. The patient’s records showed a medical history of hypercholesterolemia, overweight, heartburn, back pain, and burnout, but no renal diseases. Preoperative and postoperative medication included analgesics (Voltaren®, Novalgin®), proton-pump inhibitor (Pantozol® 40), low-molecular-weight heparin (Clexane® 60 subcutan), and single-shot antibiotic Zinacef® (cefuroxime) as prophylaxis during surgery. Due to the fact that no gentamicin was detectable in the patient’s blood and renal injury is dose-dependent, we, as well as the attending physicians, do not link the deviation in laboratory parameters to the release of gentamicin. Furthermore, we could not see any clinical signs of renal failure, such as a decrease in urine production, edema, or pleural effusions. We see the intraoperative application of cefuroxime as the cause for the changes in the renal retention markers. Manufacturer’s specifications and the literature indicate that cefuroxime as well as gentamicin can induce acute renal failure.46,47 Overall, no severe side effects occurred, which could be linked to systemic gentamicin exposure. In the course of this prospective, observational study, we were able to confirm that gentamicin-coated nails do not release gentamicin into the systemic circulation above the lowest detectable level of 0.2 mg/dL. Our findings suggest that no relevant amount of gentamicin for causing a systemic effect is released into the systemic circulation, although in vivo studies showed high local concentrations of gentamicin on the implant site.11,18,30 This fits our observation that no severe side effects could be linked to implantation. Postoperative monitoring of renal function does not seem necessary after implantation of ETN PROtect. Furthermore, no allergic reactions were observed during our study. Our findings suggest that no relevant amount of gentamicin is released into the circulation that could cause a systemic effect. We conclude that serious side effects due to systemic gentamicin release by gentamicin-coated tibia nails are not to be feared. Postoperative monitoring of renal function does not seem necessary because of the implantation of ETN PROtect. In our opinion, ETN PROtect is an important strategy for infection prophylaxis and safe in clinical use. The authors have revealed all financial and personal relationships to other persons and organizations that could inappropriately influence (bias) this work. GS is a consultant for SYNTHES USA and owns a patent on gentamicin coating of implants. The authors report no other conflicts of interest in this work. Schmidmaier G, Lucke M, Wildemann B, Haas NP, Raschke M. Prophylaxis and treatment of implant-related infections by antibiotic-coated implants: a review. Injury. 2006;37(Suppl 2):S105–S112. Schmidmaier G, Moghaddam A. [Long bone nonunion]. Z Orthop Unfall. 2015;153(6):659–676. Moghaddam A, Zietzschmann S, Bruckner T, Schmidmaier G. Treatment of atrophic tibia non-unions according to ‘diamond concept: Results of one- and two-step treatment. Injury. 2015;46(Suppl 4):S39–S50. Lima AL, Oliveira PR, Carvalho VC, Cimerman S, Savio E; Diretrizes Panamericanas para el Tratamiento de las Osteomielitis e Infecciones de Tejidos Blandos Group; Recommendations for the treatment of osteomyelitis. Braz J Infect Dis. 2014;18(5):526–534. Miska M, Findeisen S, Tanner M, et al. Treatment of nonunions in fractures of the humeral shaft according to the Diamond Concept. Bone Joint J. 2016;98-B(1):81–87. Moghaddam A, Ermisch C, Schmidmaier G. Non-union current treatment concept. Shafa Ortho J. In Press 2015. Halawi MJ, Morwood MP. Acute management of open fractures: An evidence-based review. Orthopedics. 2015;38(11):e1025–e1033. Makridis KG, Tosounidis T, Giannoudis PV. Management of infection after intramedullary nailing of long bone fractures: treatment protocols and outcomes. Open Orthop J. 2013;7:219–226. Moghaddam A, Zimmermann G, Hammer K, Bruckner T, Grützner PA, von Recum J. Cigarette smoking influences the clinical and occupational outcome of patients with tibial shaft fractures. Injury. 2011;42(12):1435–1442. Moghaddam-Alvandi A, Zimmermann G, Hammer K, Bruckner T, Grützner PA, von Recum J. Cigarette smoking influences the clinical and occupational outcome of patients with tibial shaft fractures. Injury. 2013;44(11):1670–1671. Fuchs T, Stange R, Schmidmaier G, Raschke MJ. The use of gentamicin-coated nails in the tibia: preliminary results of a prospective study. Arch Orthop Trauma Surg. 2011;131(10):1419–1425. Gaebler C, Berger U, Schandelmaier P. Rates and odds ratios for complications in closed and open tibial fractures treated with unreamed, small diameter tibial nails: a multicenter analysis of 467 cases. J Orthop Trauma. 2001;15(6):415–423. Noumi T, Yokoyama K, Ohtsuka H, Nakamura K, Itoman M. Intramedullary nailing for open fractures of the femoral shaft: evaluation of contributing factors on deep infection and nonunion using multivariate analysis. Injury. 2005;36(9):1085–1093. Dhammi IK, Ul Haq R, Kumar S. Prophylactic antibiotics in orthopedic surgery: Controversial issues in its use. Indian J Orthop. 2015;49(4):373–376. Mendel V, Simanowski HJ, Scholz HC, Heymann H. Therapy with gentamicin-PMMA beads, gentamicin-collagen sponge, and cefazolin for experimental osteomyelitis due to Staphylococcus aureus in rats. Arch Orthop Trauma Surg. 2005;125(6):363–368. Loca D, Sokolova M, Locs J, Smirnova A, Irbe Z. Calcium phosphate bone cements for local vancomycin delivery. Mater Sci Eng C Mater Biol Appl. 2015;49:106–113. Letsch R, Rosenthal E, Joka T. [Local antibiotic administration in osteomyelitis treatment – a comparative study with two different carrier substances]. Aktuelle Traumatol. 1993;23(7):324–329. Knaepler H. Local application of gentamicin-containing collagen implant in the prophylaxis and treatment of surgical site infection in orthopaedic surgery. Int J Surg. 2012;10(Suppl 1):S15–S20. Folsch C, Federmann M, Kuehn KD, et al. Coating with a novel gentamicin palmitate formulation prevents implant-associated osteomyelitis induced by methicillin-susceptible Staphylococcus aureus in a rat model. Int Orthop. 2015;39(5):981–988. Inzana JA, Schwarz EM, Kates SL, Awad HA. Biomaterials approaches to treating implant-associated osteomyelitis. Biomaterials. 2016;81:58–71. Westhauser F, Zimmermann G, Moghaddam S, et al. Reaming in treatment of non-unions in long bones: cytokine expression course as a tool for evaluation of non-union therapy. Arch Orthop Trauma Surg. 2015;135(8):1107–1116. Kumar CG, Himabindu M, Jetty A. Microbial biosynthesis and applications of gentamicin: a critical appraisal. Crit Rev Biotechnol. 2008;28(3):173–212. Hariprasad G, Kumar M, Rani K, Kaur P, Srinivasan A. Aminoglycoside induced nephrotoxicity: molecular modeling studies of calreticulin-gentamicin complex. J Mol Model. 2012;18(6):2645–2652. Lucke M, Schmidmaier G, Sadoni S, et al. A new model of implant-related osteomyelitis in rats. J Biomed Mater Res B Appl Biomater. 2003;67(1):593–602. Taylor GJ, Bannister GC, Calder S. Perioperative wound infection in elective orthopaedic surgery. J Hosp Infect. 1990;16(3):241–247. Dapunt U, Spranger O, Gantz S. Are atrophic long-bone nonunions associated with low-grade infections? Ther Clin Risk Manag. 2015;11:1843–1852. Lopez-Novoa JM, Quiros Y, Vicente L, Morales AI, Lopez-Hernandez FJ. New insights into the mechanism of aminoglycoside nephrotoxicity: an integrative point of view. Kidney Int. 2011;79(1):33–45. Lerner SA, Schmitt BA, Seligsohn R, Matz GJ. Comparative study of ototoxicity and nephrotoxicity in patients randomly assigned to treatment with amikacin or gentamicin. Am J Med. 1986;80(6b):98–104. Fassbender M, Minkwitz S, Kronbach Z, et al. Local gentamicin application does not interfere with bone healing in a rat model. Bone. 2013;55(2):298–304. World Medical Association. World Medical Association Declaration of Helsinki: ethical principles for medical research involving human subjects. JAMA. 2013;310(20):2191–2194. Moghaddam A, Breier L, Haubruck P, et al. Non-unions treated with bone morphogenic protein 7: introducing the quantitative measurement of human serum cytokine levels as promising tool in evaluation of adjunct non-union therapy. J Inflamm (Lond). 2016;13:3. Bender D, Haubruck P, Boxriker S, Korff S, Schmidmaier G, Moghaddam A. Validity of subjective smoking status in orthopedic patients. Ther Clin Risk Manag. 2015;11:1297–1303. Dahlgren JG, Anderson ET, Hewitt WL. Gentamicin blood levels: A guide to nephrotoxicity. Antimicrob Agents Chemother. 1975;8(1):58–62. van Raaij TM, Visser LE, Vulto AG, Verhaar JA. Acute renal failure after local gentamicin treatment in an infected total knee arthroplasty. J Arthroplasty. 2002;17(7):948–950. Nast S, Fassbender M, Bormann N, et al. In vivo quantification of gentamicin released from an implant coating. J Biomater Appl. Epub 2016 Feb 10. Diefenbeck M, Muckley T, Hofmann GO. Prophylaxis and treatment of implant-related infections by local application of antibiotics. Injury. 2006;37(Suppl 2):S95–S104. Lucke M, Schmidmaier G, Sadoni S, et al. Gentamicin coating of metallic implants reduces implant-related osteomyelitis in rats. Bone. 2003;32(5):521–531. Clyne B, Olshaker JS. The C-reactive protein. J Emerg Med. 1999;17(6):1019–1025. Pepys MB, Hirschfield GM. C-reactive protein: a critical update. J Clin Invest. 2003;111(12):1805–1812. Gressner AM, Arndt T. Lexikon der Medizinischen Laboratoriumsdiagnostik: Band 1 Klinische Chemie. [Dictionary for Medical Laboratory Diagnostic: Volume I Clinical Chemistry]. SpringerLink: Bücher. 2007, Berlin, Heidelberg: Springer. Munker R, Hiller E, Glass J, Paquette R. Modern Hematology: Biology and Clinical Management (Contemporary Hematology). 2nd ed. Totowa, NJ: Humana Press; 2007. Czaplicki AP, Borger JE, Politi JR, Chambers BT, Taylor BC. Evaluation of postoperative fever and leukocytosis in patients after total hip and knee arthroplasty. J Arthroplasty. 2011;26(8):1387–1389. Gowda S, Desai PB, Kulkarni SS, Hull VV, Math AA, Vernekar SN. Markers of renal function tests. N Am J Med Sci. 2010;2(4):170–173. Leong CL, Thiruventhiran T. Cefuroxime-induced acute renal failure. Nephron. 2000;84(2):185. Trollfors B, Suurkula M, Price JD, Norrby R. Renal function during cefuroxime treatment in patients with pre-existing renal impairment. J Antimicrob Chemother. 1980;6(5):665–670. Walenkamp GH, Vree TB, van Rens TJ. Gentamicin-PMMA beads. Pharmacokinetic and nephrotoxicological study. Clin Orthop Relat Res. 1986;(205):171–183.